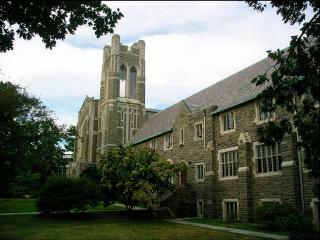 The First Congregational Church in Montclair, New Jersey is a congregation of the United Church of Christ (www.ucc.org). A mainline, Protestant denomination. The church was built in 1920 in the perpendicular Gothic style.The nave memorial window was dedicated to the young men of the church who lost their lives in World War I, and the belltower was built to the memory of Amory Howe Bradford, a prominent Montclair citizen who was pastor of the church between 1870-1911. The structure is listed on both the National and State Registers of Historic Places.